Are you ready for some good ol' fashioned Southern charm and comfort food? Cowboys and Angels Restaurant and Bar offers a self-professed "taste of Southern class", with the goal being to create an upbeat and inviting atmosphere for patrons of all ages and walks of life. Although the bar serves up an excellent selection of cold brews to help the grown-ups take a load off and relax, the restaurant is extremely family friendly and offers irresistibly delicious dishes for everyone. 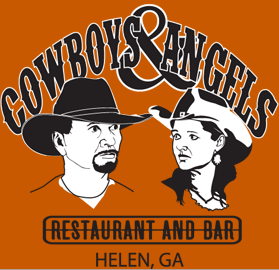 If you're looking for a casual spot to kick back, dig in to some amazing eats, and enjoy the company of new friends and old, Cowboys and Angels is one of the best places to eat in Helen. Life has a tendency to become overcomplicated, and the folks at Cowboys & Angels are passionate about the fact that food and the dining experience should be kept as simple as possible. Keeping it casual is the goal when it comes to the dishes prepared, the drinks poured, and the atmosphere provided. From the moment that you walk in the door, you'll feel relaxed at and at home in the restaurant and bar. Famous for a friendly and accommodating staff, you'll be greeted with famous Southern hospitality and all of your needs will be met. It's nothing overly fancy or over-the-top which is what makes this spot so special to those who are lucky enough to dine there. When in Rome, do as the Romans do. When in the South, eat like a Southerner! Get things started off right by sinking your teeth into some freshly made fried green tomatoes - prepared from locally grown produce. Looking for something a bit more filling? You might gravitate toward the restaurant's Bourbon Street Crab Cake or an appetizer plate of hot, succulent chicken tenders. Even if you're watching your weight, you'll find something good to get the meal going with. Whether you're sipping on a yummy soup or are enjoying a house salad, you can be proud of the fact that you're sticking to your diet while still enjoying full flavor. Enough with the appetizers! A burger is always the perfect All-American solution for lunch or dinner, and you can have your pick of a beef or bison burger with all the fixins like cheese, bacon, caramelized onions, mushrooms, and avocado. Sandwiches like like the popular Cowboys and Angeles Grilled Cheese on Texas Toast, Crab Cake BLT, or Chicken Sandwich are also a great pick. Still, the restaurant is better known for its succulent steaks and seafood platters. You'll get nothing but 100% Certified Aged Angus Beef when you order a ribeye or filet mignon here. And you'll definitely get your seafood fix. From fish and chips to fresh salmon filet to lobster tails, Cowboys and Angels has it all. Save any room for dessert? You won't want to miss out on the restaurant's famous strawberry shortcake with rest fruit. And chocolate lovers won't be able to resist the chocolate pecan hot fudge brownie, made fresh and in-house with a healthy scoop of ice cream on the side. When happy hour rolls around, it's time to head over to Cowboys and Angels. 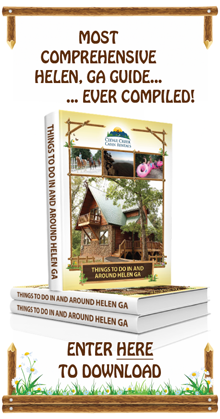 You'll always find excellent deals and specials on select draft beers, cocktails, and appetizers to enjoy as you unwind after a long day of hiking, exploring, and playing hard in Helen and its surrounding areas. Of course, Cowboys and Angels also offers other specials at various points throughout the week, so be sure to keep an eye on their Facebook page in order to see how you can score the best deals when you visit. And when you consider how reasonably priced all of the restaurant's dishes and drinks are already, that's saying something! When you're on vacation during the warmer months, you don't want to miss out an an ounce of northern Georgia's crisp and fresh mountain air, or that glorious sunshine. That's why so many folks are on the lookout for an excellent restaurant with the opportunity to dine both indoors and outdoors. The outside patio area of Cowboys and Angels is very spacious and accommodating, allowing your entire group to spread out and enjoy your meal as you share laughs and create memories. Even Fido is welcome to come along for lunch or dinner! Don't want to miss out on the bar experience while experiencing the great outdoors? No worries. Just slide up a stool to the outside bar and mingle with other patrons, the bartender, or catch the big game. You're bound to have a great time! Have you had a chance to stop by Cowboys and Angels Restaurant and Bar? Tell us what you ordered, and what you thought!